This unit is one of the two Household Cavalry regiments in the British Army, the other being the Life Guards. It was formed in 1969 by amalgamating the Royal Horse Guards with The Royal Dragoons (1st Dragoons), both dating back to the mid-17th century. Though best known for its ceremonial duties, it has also seen active service as a reconnaissance unit in West Germany, Northern Ireland, Cyprus and most recently Iraq and Afghanistan, as well as sending detachments to the Falklands War (1982) and Bosnia. In 1991 the two Household Cavalry units’ ceremonial troops were united into the Household Cavalry Mounted Regiment (HCMR), and their operational troops into the Household Cavalry Regiment (HCR). However, both The Life Guards and The Blues and Royals retain their own separate identities, colonels, traditions and uniforms. For The Blues and Royals, one of those traditions is calling its newest officers cornets not second lieutenants and another is wearing a French eagle as their sleeve badge, a tradition inherited from the 1st Dragoons, who captured one at Waterloo. The Blues and Royals contribute two squadrons to the HCR and one squadron to the HCMR, based in Windsor and central London respectively. Both Prince William and Prince Harry became officers in the regiment in 2006 and William wore its uniform at his wedding in April 2011. 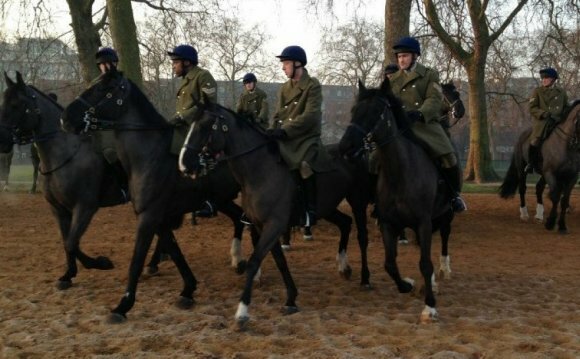 Household Cavalry Blues & Royals Passing Out Parade!